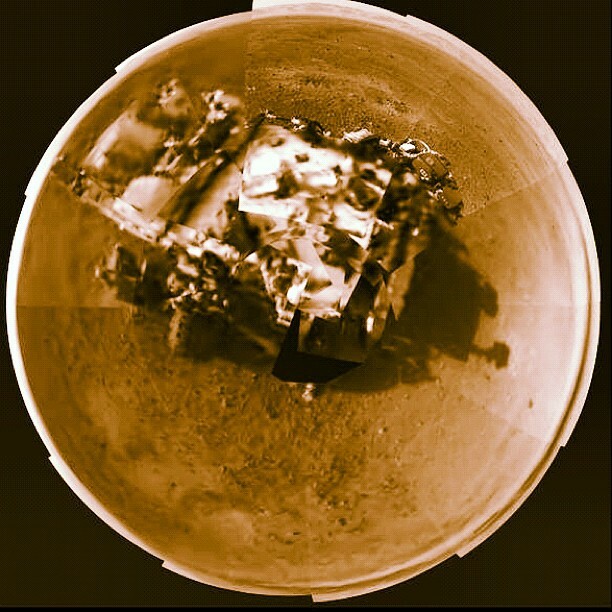 Photo – Rover’s Self Portrait (link): this Picasso-like self portrait of NASA’s Curiosity rover was taken by its Navigation cameras, located on the now-upright mast. 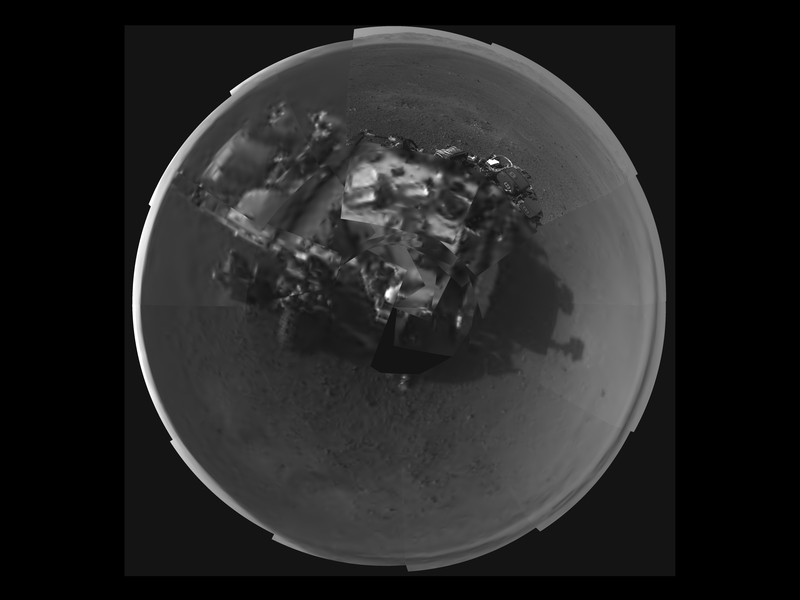 The camera snapped pictures 360-degrees around the rover, while pointing down at the rover deck, up and straight ahead. Those images are shown here in a polar projection. Most of the tiles are thumbnails, or small copies of the full-resolution images that have not been sent back to Earth yet. Two of the tiles are full-resolution. Image credit: NASA/JPL-Caltech (August, 9, 2012). [6000 x 4500 full size link]. “There is an entire genealogy to be written from the point of view of the challenge posed by insect coordination, by “swarm intelligence.” Again and again, poetic, philosophical, and biological studies ask the same question: how does this “intelligent,” global organization emerge from a myriad of local, “dumb” interactions?” — Alex Galloway and Eugene Thacker, The Exploit. […] The interest in swarms was intimately connected to the research on emergence and “superorganisms” that arose during the early years of the twentieth century, especially in the 1920s. Even though the author of the notion of superorganisms was the now somewhat discredited writer Herbert Spencer,63 who introduced it in 1898, the idea was fed into contemporary discourse surrounding swarms and emergence through myrmecologist William Morton Wheeler. In 1911 Wheeler had published his classic article “The Ant Colony as an Organism” (in Journal of Morphology), and similar interests continued to be expressed in his subsequent writings. His ideas became well known in the 1990s in discussions concerning artificial life and holistic swarm-like organization. For writers such as Kevin Kelly, mentioned earlier in this chapter, Wheeler’s ideas regarding superorganisms stood as the inspiration for the hype surrounding emergent behavior.64 Yet the actual context of his paper was a lecture given at the Marine Biological Laboratory at Woods Hole in 1910.65 As Charlotte Sleigh points out, Wheeler saw himself as continuing the work of holistic philosophers, and later, in the 1910s and 1920s, found affinities with Bergson’s philosophy of temporality as well.66 In 1926, when emergence had already been discussed in terms of, for example, emergent evolution, evolutionary naturalism, creative synthesis, organicism, and emergent vitalism, Wheeler noted that this phenomenon seemed to challenge the basic dualisms of determinism versus freedom, mechanism versus vitalism, and the many versus the one.67 An animal phenomenon thus presented a crisis for the fundamental philosophical concepts that did not seem to apply to such a transversal mode of organization, or agencement to use the term that Wheeler coined. It was a challenge to philosophy and simultaneously to the physical, chemical, psychological, and social sciences, a phenomenon that seemed to cut through these seemingly disconnected spheres of reality. 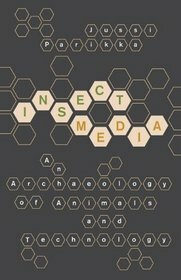 in (passage from), Jussi Parikka, “Insect Media: An Archaeology of Animals and Technology“, Chapter II – Genesis of Form: Insect Architecture and Swarms, (section) Emergence and Relatedness: A Radical Empiricism – take one, pp. 51-53, University of Minnesota Press, Minneapolis, 2011.